This is the best deal for Rio Carnival. Actually the Super cheap hotel accommodation option for Carnival in Rio de Janeiro. The hotel is a decent 2 star, clean, safe and fairly well equipped with A/C, Frigobar, TV with cable. This is ideal for those looking to enjoy carnival in Rio without breaking the bank. 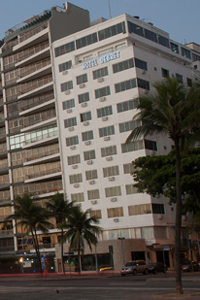 Overlooking the Guanabara Bay and the Sugar Loaf, the Aeroporto Othon Travel Hotel is ideally located in the center of Rio de Janeiro, close to lots of carnival activities. WI-FI in the lobby and cabled broadband internet in the rooms. Breakfast is included. When would you like to stay at Aeroporto Othon Hotel ? 1) Rates at the Aeroporto Othon Hotel may not be valid during Carnival, New Years, Easter and other special dates.